In a quiet corner of Texas with vast lands for agriculture, Tornillo has been making national news since President Trump erected his first migrant tent city last week. This small town with no traffic lights has a population of roughly 1,568, according to the latest Census data. In June 2018, that all changed, when the Trump administration rushed to construct a tent city detention facility for migrant children at the Marcelino Serna Port of Entry on the Mexican border of the town, which attracted protestors, lawmakers, and media from all over the nation. Known as the Tornillo tent city, it is a temporary detention facility for migrant children operated by the Department of Health and Human Services. The tent city can house about 450 illegal immigrant children. The location was confirmed on June 14, after MSNBC and a handful government picked reporters toured America’s largest detention facility for migrant children inside an old Walmart in Brownsville, Texas. Within 24 hours of being erected, the tent city housed more than 100 minors, as the Trump administration scrambled to contain the overflow and avoid a national crisis. “With the 2018 midterm elections in the not too distant future, the Trump administration’s zero-tolerance immigration policy could turn into an overcrowding crisis at facilities, as some reporters who toured the Casa Padre facility [Walmart detention center] have already pointed out. President Trump, who had defended the zero-tolerance immigration policy blamed Democrats even though his administration implemented the new immigration law, looking ahead, the president signed an executive order Wednesday to end the separation because of the media excitement of the detention facilities could damage Republicans in the upcoming midterms. 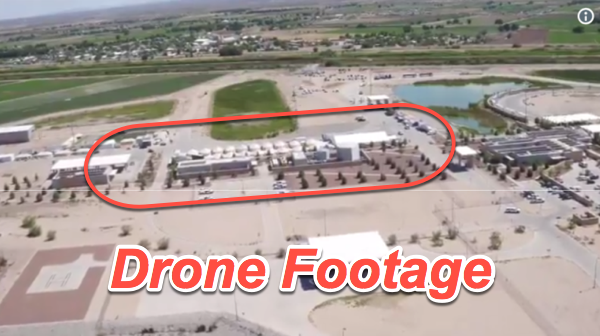 BBC News originally posted drone footage showing a temporary detention facility for migrant children operated by the Department of Health and Human Services, in Tornillo, Texas. BBC News posted a series of aerial videos from a drone, which shows children walking into a tent city in Tornillo. And another angle of the children walking into the facility. You Decide: Does this tent city detention facility for migrant children look like “summer camps” to you?